Elektra Magnesium Charge Lotion can be used as body or massage lotion as well as underarm deodorant and comes in 100mL airless pump as well as a 500mL pump bottle (recyclable plastic). Nutritious plant butters and oils for skin care are still prominent in this formula, but it contains less fats compared to Magnesium Cream. 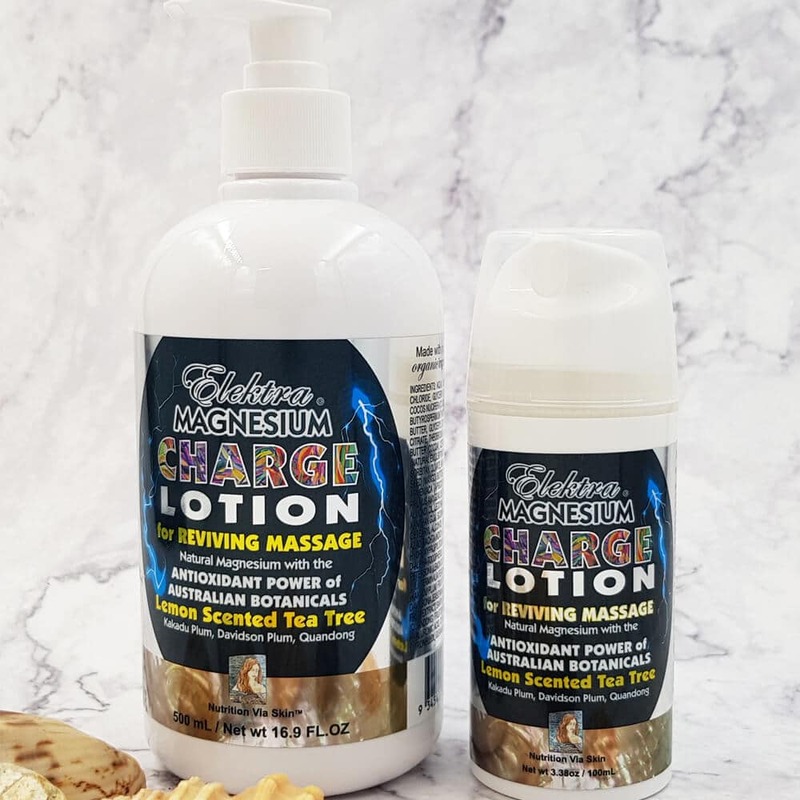 Elektra Magnesium CHARGE Lotion is more astringent and suitable for those with skin types that need less fattiness for skin barrier protection, but more magnesium for muscle care (teenagers, athletes, men). Texture is silky smooth, light and moisture-attractive thanks to the hyaluronic acid. The lotion is absorbed and incorporated beautifully into the epidermis, plumping it up with hydration and leaving no sticky residue. Powerful antioxidant Australian botanical extracts of Kakadu Plum, Davidson Plum and Quandong add extra cleansing and collagen support. Lemon-scented tea tree gives the lotion a fresh aroma of tangy lemon sorbet whilst adding anti-microbial and antiseptic benefits. Note: If using on face, those with sensitive skin may find it tingles temporarily before full absorption. If you have shaved prior to application then it can even feel stinging due to broken skin. Best to work it in around damaged skin areas. It can also be diluted by adding a bit of extra vegetable oil when you massage it in. 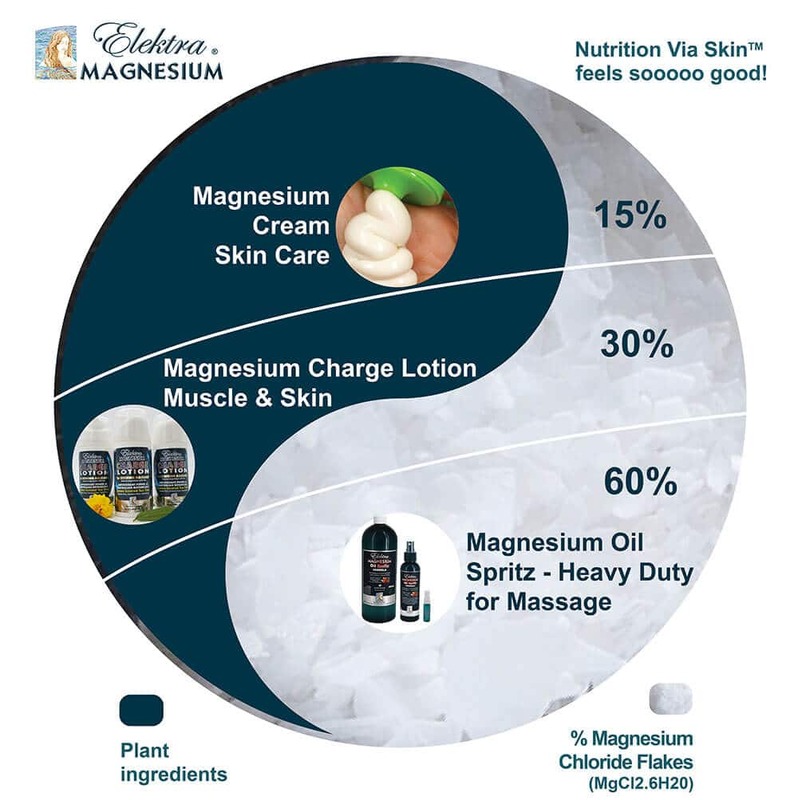 Elektra Magnesium products are made with natural and organic ingredients and do not contain parabens, pthalates, petrochemical products, animal products, or other synthetic toxic chemicals like dimethicone, phenoxyethanol or benzoates. Despite not using toxic preservatives, our laboratory Preservative Efficacy Test passed with flying colours! PURIFIED WATER, 30% MAGNESIUM CHLORIDE HEXAHYDRATE, VEGETABLE GLYCERIN, BUTYROSPERMUM PARKII (SHEA) BUTTER, COCOS NUCIFERA (COCONUT) OIL, GLYCERYL STEARATE CITRATE, OLIVEM 1000 (NATURAL OLIVE EMULSIFYING WAX), CACAO (COCOA) SEED BUTTER, MANGIFERA INDICA (MANGO) SEED BUTTER, PRUNUS ARMENIACA (APRICOT) KERNEL OIL, PRUNUS AMYGDALUS DULCIS (SWEET ALMOND OIL), LECITHIN, CETYL ALCOHOL, XANTHAN GUM, SODIUM BORATE, CETEARYL ALCOHOL, AZADIRACHTA INDICA (NEEM) OIL, HYDROXYPROPYL STARCH PHOSPHATE, D-ALPHA-TOCOPHEROL (NATURAL VITAMIN E), ESSENTIAL OIL: LEPTOSPERMUM PETERSONII (LEMON SCENTED TEA TREE), EXTRACTS: TERMINALIA FERDINANDIANA FRUIT (KAKADU PLUM), DAVIDSONIA JERSEYANA (DAVIDSON PLUM), SANTALUM ACUMINATUM (QUANDONG), HYALURONIC ACID, LIMONENE. 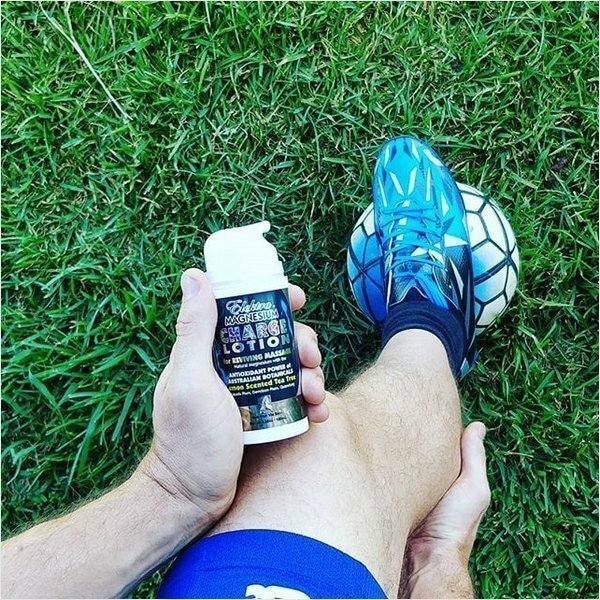 One dessertspoon -12g- Charge Lotion delivers approx 550mg elemental magnesium. The products can be combined to suit individual skin and body care needs. Some people may need a daily top-up of 400-500mg of magnesium to supplement diet, whilst others may need more than 1,000mg if they are under excessive stress, work physically hard or have other health issues. 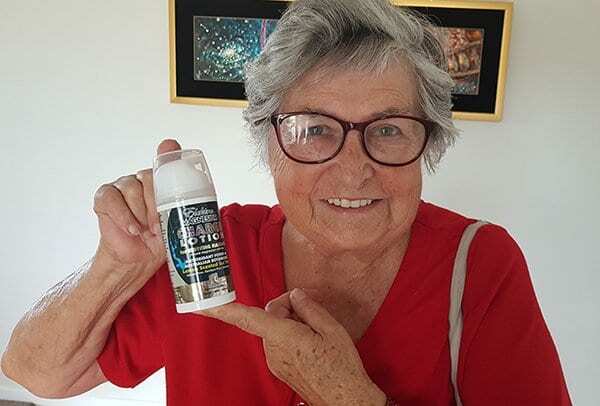 For high level needs, in addition to eating more magnesium-containing organic foods, it’s a good idea to combine various magnesium topical applications, such as magnesium soaking, magnesium moisturising using Magnesium Cream, and magnesium massage using Magnesium Charge Lotion and/or Magnesium Oil Spritz.